I lived in Edinburgh both as a medical student and as a general practitioner for a couple of decades. One of my most favourite places in the world is in Edinburgh – The Royal Botanic Gardens. The gardens are pretty extensive and you can see something different every single time you go. I used to go several times a week when I lived close by. Click here and you’ll see a satellite photo of the gardens to give you an idea of their scale. 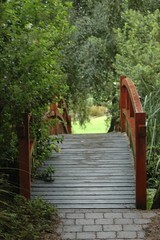 Whenever I had visitors come to stay for a few days, I’d take them to “the Botanics”. So one day I took two Dutch doctor friends of mine for a visit to the gardens. 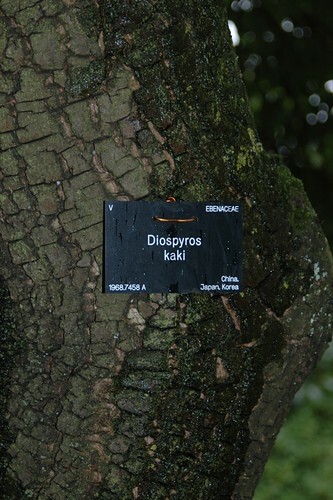 Like me, they specialise in homeopathic medicine and as we walked around the gardens they were telling me about a homeopathic medicine prepared from the Diospyros kaki tree which survived the nuclear blast in Nagasaki. They’d had some experience using it in helping patients to recover from severe shocks – specifically patients with either Post Traumatic Stress Disorder, or with cancer. Back to my story……….well, I had never heard before that any tree had withstood the blast in Nagasaki but apparently one did. 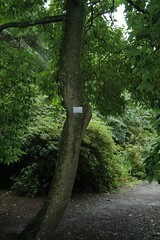 It was a Japanese Persimmon tree (Diospyros kaki), one of the Ebony family of trees. The particular Nagasaki specimen has had cuttings taken and sent all around the world to be planted and nurtured as a “peace tree”. We chatted as we walked over the bridge and into a copse of trees. 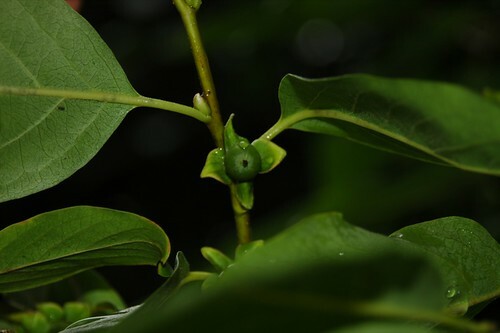 What does this Diospyros kaki tree look like I asked my friend. Well, she said, it looks quite like that tree over there and pointed to the nearest tree to where we were standing. Let’s go and take a closer look I suggested and used my usual technique for identifying trees in the Botanics – I looked at the label! Well! We were stunned! Of all the trees in the Botanics what on earth were the chances that we’d be standing next to the one example in the gardens of the particular tree we were discussing?! My Dutch friend said, “I don’t know what you believe about how the world works, Bob, but I’m going to send you a sample of the remedy prepared from the kaki tree. 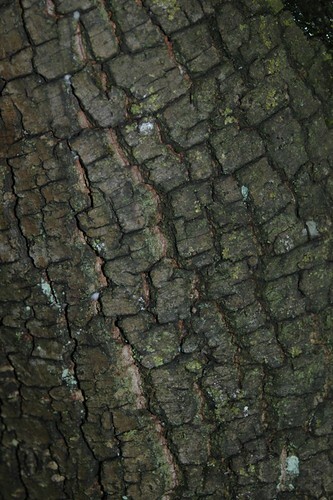 Before I tell you the next part of the story, have a look at the bark of this tree. My colleague was as good as her word and the following week two vials of the homeopathic remedy arrived for me at the dispensary in Glasgow Homeopathic Hospital. The following day I had a new patient, a young woman whose recurrent breast cancer disease had recently been described by the oncologists as terminal and who had been told she had very few weeks left to live. She was suffering from nightmares and sleeplessness which none of the sedatives she’d been prescribed had helped and she wanted to try a homeopathic medicine. I’m not going to give any more detail than that here but suffice it to say, I gave her the Diospyros kaki remedy and her sleep immediately returned to normal. In fact, more startling than that, she went on to experience an improvement in her energy and well-being and she went on to live for another couple of years. In those two years she stopped her career, trained in another area altogether, and worked successfully in her new field for a few months before the cancer overwhelmed her and she died. I’ve used this remedy a few times since in similar circumstances. It’s one of the remedies which really makes me think about our basic concepts of health and healing. It does not cure cancers, but in the right circumstances, in my very small experience with this, it can help a patient cope, and, more than that, even to grow in the presence of severe disease. This is a very interesting article for me to read as I started eating Kaki fruit daily at least 2 a day – my friend who is diabetic would like to know if she could eat Kaki as she is worried that they may contain too much sugar. It is important for a diabetic is to keep their blood sugar under good control, but no single foodstuff should be avoided because of it’s sugar content. How much kaki fruit would alter her blood sugar would depend on how much of it she ate. So the best advice is to try some within her over all diet and continue to monitor her blood sugar as she normally does. Did you know there is a kaki tree planted in Glasgow’s Botanic Gardens that is a direct descendant of the tree that survived the atomic blast in Nagasaki?